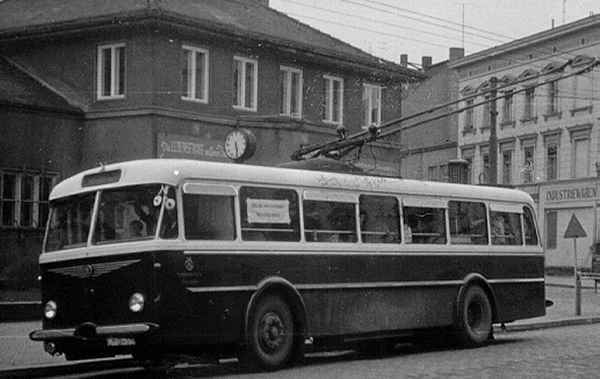 In November 1958 the rolling stock was extended by two trolleybuses of the Czech type ŠKODA 8 Tr. Both vehicles were manufactured by the company ŠKODA Ostrov / ČSSR. The trolleybuses of the Czech type ŠKODA 8 Tr showed a series of technical innovations. They had three doors and a firm conductor place. The driver could serve all three doors and the woman conductor the middle and rear door. The vehicles were equipped with a novel direct electrical control system over 24 V-control switch. For the first time the trolleybuses were equipped with spring loaded retrievers (mechanical gripping devices for rapid lowering of the current collectors when dewiring). These had the task to retract the current collectors automatically downward when dewiring and to thus prevent a possible damage of the trolley system.